It's the holiday season in an election year. New Yorkers prepare to celebrate with masked revels and parades, while the city's powerful hold fund raisers and give speeches. Business as usual in the Modern Gomorrah, but when someone or something hunts New York's streets, eviscerating stray animals, slaying the homeless where they huddle, and stealing women from shelters - it threatens a councilwoman's re-election bid. Dangerous occult texts missing from the massive 5th Avenue Public Library, mad politicians hiding in their posh Park Avenue apartments and a new Egyptian exhibit premiering at the Metropolitan Museum this holiday season embroil the investigators in a secret war for access to the halls of power. From New York's high society to her mean streets, stalked beneath Times Square's busy lights by Things Man Was Not Meant to Know, the investigators must swiftly unravel a bloody skein of occult clues and confront the power behind the killings - or this holiday season may prove their last. 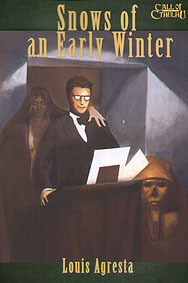 Snows of an Early Winter is a stand-alone Call of Cthulhu adventure set in modern day New York City. It contains everything a group needs for a few evenings of investigation and horror, including the scenario, pre-generated characters, and hand outs. It is the latest in the innovative line of officially licensed Call of Cthulhu scenarios and supplements from Super Genius Games.